The UK Met Office write “Why was the start to spring 2013 so cold? “Potential”, “may predispose”? Does it or doesn’t it, don’t they know? IMO the only good part of their web item is labelled (2) where the explanation may lie. The rest is flapping and jumping around over nothing. The Met Office are not very good with sequence, cause and effect. That is wrong in part, “during winter and early spring,”, it actually is any time, eg. the notorious Blogdale 2003 where I expect to have some revelations to make including the mess. There is more than SSW originating high in polar air. Link to Met Office item. I’ll leave the rest to comments. Posted by Tim Channon. Rog highlighted the item but is busy. Just finished gardening. Now taking the missus out for our anniversary. The MET O are hedging bets IMO. Trying to steer between warmist sensibilities and meteorological realities. Wriggle wriggle., squirm, squirm, slither, slither. The use of qualifiers, caveats and conditionals: words that are appropriate when you admit that your level of uncertainty is high, but weasel words when you claim the science is settled, the outcome, certain. Or you are paid to tell people stuff to allow them to plan. For black-and-white, engineering minds in climate science that say with enough computer code and power we can determine the number of angels who can dance on the head of a pin, the use of “could”, “may”, “might”, “should” is bizarre. This group of minds who wish to determine our future to a farthing’s worth of our savings are unable to use the words “does”, “will” or “shall”. Look to the end of ALL climate papers. The present or future subjunctives thrive while the declamations of what we HAVE TO DO leap out at us. The disconnect, one would think, give the warmists a cognitive dissonant headache. Gore buys a beach house while the German governor takes a holiday home in a Turkey. Gore divests himself of the Carbon Exchange in Chicago and his green investments while in Britain the governors essentially tax your energy use to pay for windmills on the land of the aristocrats controlled by companies who have Lords as directors. The Met Office is the intellectual tool of the emotional right brain of the Eco-Green. Meanwhile, the rational left brain of the Eco-Green buys snow shovels and hides his coinage from the taxman in his mattress. Will we ever get to a point where one is accountable for standing by what he is paid to determine, and is tasked with saying what WILL happen, not what “might”, “could”, “may” or “should”? It is not that we will shoot those who fail to predict: where there are reasons errors are justifiable and acceptable. So far the Met Office – as the IPCC – speak mumbly-peg and excuses that we wouldn’t accept from our children explaining how the lamp got broken. The stratosphere stopped cooling around 2000 and may have warmed a little since. Contrary to expectations ozone above 45km increased between 2004 and 2007 whilst the sun was less active. More ozone results in warming. Logic suggests that a quiet sun warms the stratosphere especially towards the poles leading to a more negative Arctic Oscillation and more, stronger sudden stratospheric warming events with associated surges of cold air across middle latitudes. An active sun does the opposite as witness the pre 2000 period of more positive AO. Tony B (Brown) and I have discussed the subject for at least 2-3 years. I blame ‘Russians’, or at least their volcanoes. One single eruption in the Kamchatka peninsula (December to March inclusive) can cause spike in SSW that will be followed by ‘Sudden Tropospheric Cooling’ -STC ( 🙂 ) in the N. Hemisphere’s weather for up to a month. In this link there is a NOAA animation showing the exact source of the SSW. Logic suggests that a quiet sun warms the stratosphere especially towards the poles..
SSW (sudden stratospheric warming) can be triggered only when sun is below horizon Dec, Jan and occasionally Feb, whole process can last 2-4 weeks, it is usually over by the time the sun moves north of the equator. My apologies to Stephen Wilde for name misspelling, if Tim or TB could correct I would be grateful. My heliocentric planetary analysis showed a very cold signal for this March, with zero uncertainty. A deterministic forecast could have been made 1yr or 100yrs back, it makes no difference. Maybe I am wrong about SSW and any time of the year. Something like that seems to happen leading to unusual on high conditions probably in radiosonde data but definitely in radio propagation. Doug Proctor missed out Tim Flannery’s property on the banks of the Hawkesbury river, NSW, Aus. Vuk: Have you gathered any data on Kamchatkan volcanos which have ‘gone stratospheric’ to compare with the occurrence of SSW’s? likely is that there is only one active volcano in the area, Mt. Erebus..
And then compare two graphs on the last page (circle highlighted areas) for 1978-2008 SSW max at both polar areas. Re the Met Office, the last comments in the main paper may suggest a change of attitude. Certain climate alarmist claims about the Arctic are described as ‘contentious’. summer, is responsible for this year’s cold spring. It is argued that amplification of global warming over the Arctic is reducing the equator to pole temperature gradient, thereby weakening the strength of the mid-latitude jet streams. In turn this may lead to slower progression of upper-level waves and would cause associated weather patterns in mid latitudes to be more persistent, potentially leading to an increased probability of extreme weather events that result from prolonged conditions, such as drought, flooding, cold spells, and heat waves. ‘Little evidence’ for the warmers. About some misconceptions regarding the Northern Hemisphere’s magnetic pole. – There are two centres of magnetic intensity, one to the west of Hudson Bay and the other in the central Siberia. These locations have been more or less stationary since 1600’s (based on the compass historic data). What has changed is their relative intensity. The Hudson Bay’s leg has been loosing while the Siberian gaining the strength. is cantered on location of blue dots. If climate is influenced by geomagnetic field action on cosmic rays (Svensmark etc) or similar, then there was no appreciable movement of the N. pole since 1900 (blue dots link). 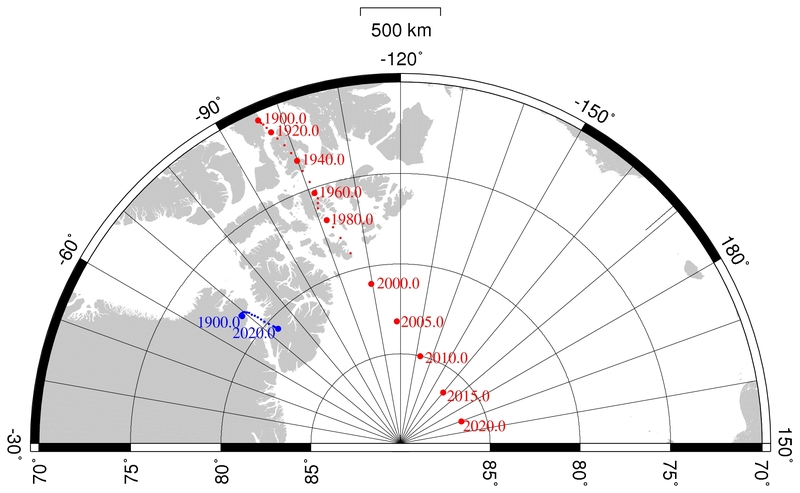 If the magnetic field change effect is on the ocean currents than average of two fields on the surface is the factor, than the area of strongest field in the Arctic Ocean is in the area of Beaufort Gyre (the Arctic’s circulation flywheel, see the first link) which is little to do with ‘conventional’ position of the magnetic north pole (red dots link). Finally and most likely is that the changes in magnetic field are reflected in the tectonic activity which is modulating the warm/cold currents balance in the critical areas, such as Denmark Strait, Kolbensey and Reykjanes ridge , driving the subpolar gyre (home of the AMO) the engine of heat transfer in the N. Atlantic. I don’t see that anything I said need be inconsistent with anything you said. All I propose is that the solar variations alter the temperature profile of the atmosphere so as to favour more and stronger SSW events generally when the sun is less active. In the background is a greater tendency for the AO to be negative with a quiet sun and positive with an active sun on multidecadal time scales. The point here, is what was the immediate cause of this March being so cold as opposed to say last March. I am considering multidecadal timescales and long term averages. Shorter term relationships are more affected by other internal system changes and inherent chaotic variability. Still, a period of weak sun leads to more extremes because the loops of the jets are larger and more long lasting than when the sun is active so completely opposite types pf months in successive years are more common when the sun is quiet. If you read up on the history of the LIA , Pepy’s Diaries help to some extent, one can see far greater variability and more frequent extremes than occurred during the late 20th century. False, they are determined by short term solar factors, and the solar based forecasts for this and last March (made well over a year ahead) were 100% deterministic. As for LIA variability, I have used CET as my main reference for nine years now, and know much of it like the back of my hand. I trust you will make a lot of money from the accuracy and utility of your solar based forecasts. Could you describe which solar features determined the differences between the Marches of 2012 and 2013 and could you link me to your solar based forecast of a year ago for March 2013 and two years ago for March 2012 ? The solar wind speed is important but I’m not sure if that is the whole story. What made the difference was the heliocentric planetary configurations. Some patterns augment solar activity, others diminish it. Angels — The exercise in logic for mediaeval schoolboys was the question ” How many angels could dance on the head of a pin?”….Those who were bright enough to say it was an infinite number went on to further studies. Angels being incorporeal beings. Maybe we should try the question on our politicians before allowing them to take their Seat. Gray & I were discussing the uptick on New Years day. I was talking then of a back loaded winter esp March. Only rediscovered the comment the other day then saw Vuks comment here. This Mar had parallels with 1883 which Bob T* has looked at the ENSO pattern being quite similar. A new way to calculate the value of Pi?